Santas big sneeze was written by H. E. Todd. 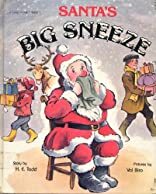 Santas big sneeze was published by Gareth Stevens. About H. E. Todd (Author) : H. E. Todd is a published author of children's books. Some of the published credits of H. E. Todd include The Sleeping Policeman, The Silly Silly Ghost, Bobby Brewster's Jigsaw Puzzle.